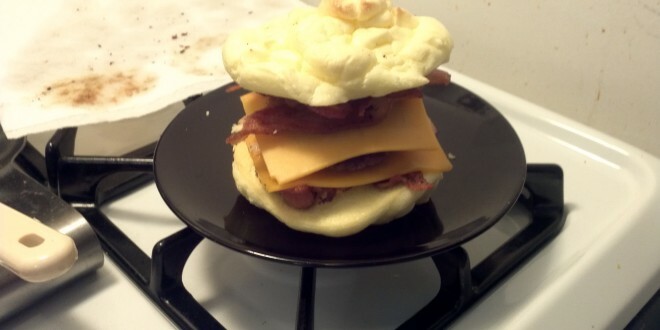 For some reason I am obsessed with the perfect Keto breakfast sandwich. 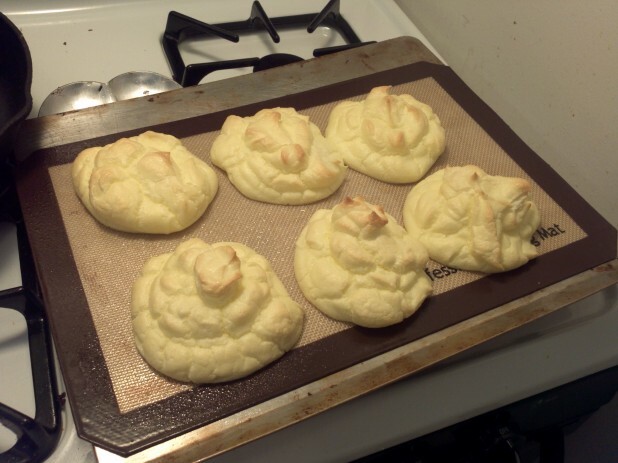 Here is my latest try at Oopsie rolls. 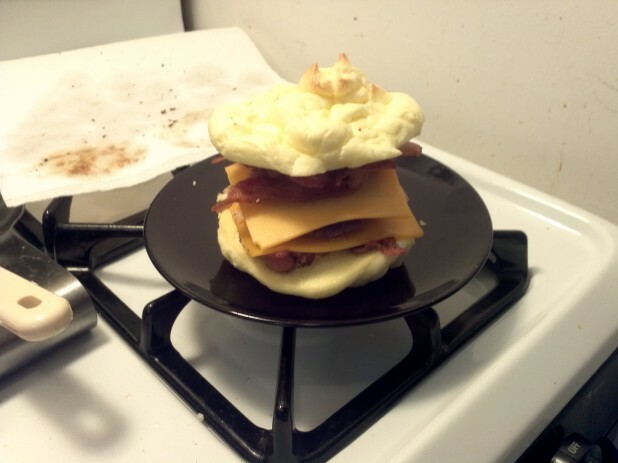 It turned out looking a lot better than last time, but it still fell apart ... Here was the process: Separate three eggs into yolks and whites. 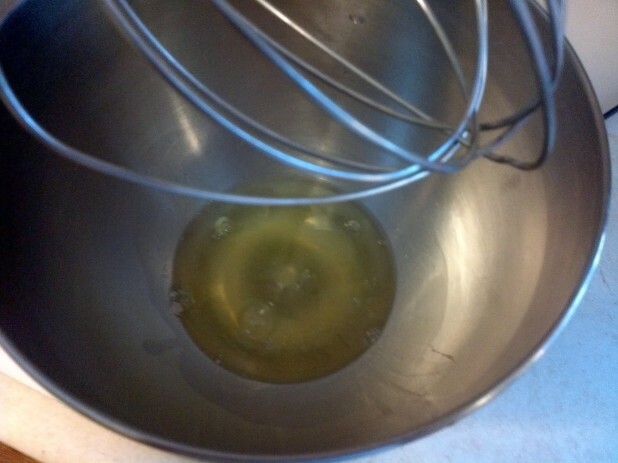 Whisk the yolk and cream cheese together. Take the whites and cream of tartar and whip the hell out of them, 3-5 minutes until really thick, glossy, stiff peaks form. 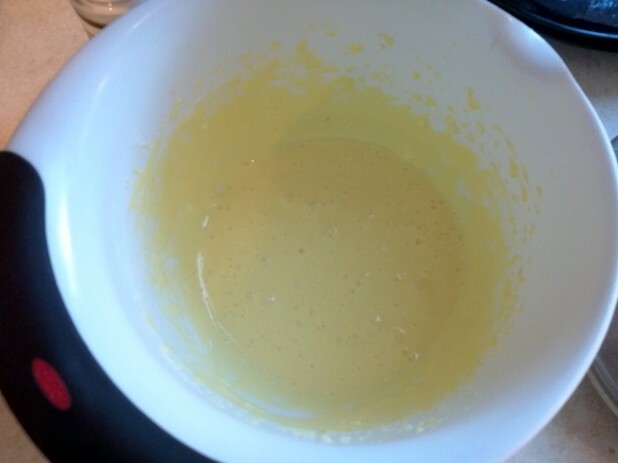 This is the batter after it has been combined with the yolk mixture. Mounded on a silicon mat. I like using the mats because it is an easier cleanup and almost nothing sticks to them! I really should have spread them flatter, probably should have made more than 6. 300 degrees for 30+ minutes until its golden brown. Looking good! I think I took them out a little early, probably should have waited for a little bit more brown. Completed Sandwich! My oopsie rolls turned out more like pancakes. Did I need to whip the eggwhites longer? Yeah, the first time I made them they were really flat and the batter was more the consistency of liquid. Is this how yours was? 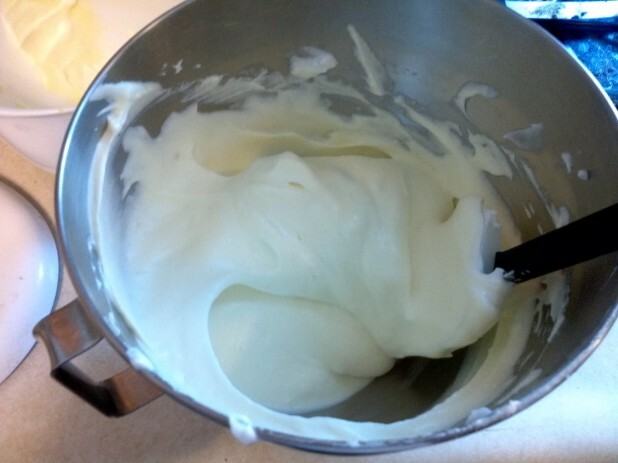 The egg whites need to be whipped for a good 3-5 minutes. It should be really thick. The final batter should need to be spooned out of the bowl because it is so thick. However, if it tasted good, its the right way! I also tried time last week, but the egg whites whipped by machine after few minutes also look liquid time (no foam) is that the eggs problem? 1. Clean your bowl and whisk. The presence of fat can inhibit egg whites developing those beautiful bubbles that turn them from liquid into glorious, glossy foam. The best way to make sure nothing goes awry is to clean everything with either vinegar or lemon/lime juice (just a little bit will do!). Wipe down your bowl and your whisk, and this will help a lot. 2. Make sure there are no bits of yolk or shell or anything else in your whites. 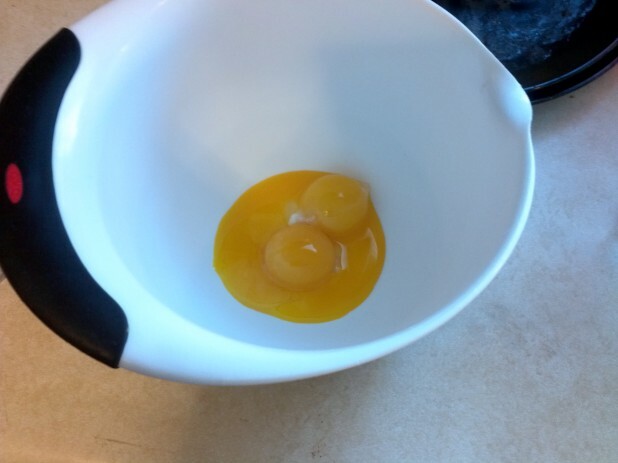 Same as before – the yolk is fatty, and its presence will make whipping the whites successfully very difficult, if not impossible. 3. If possible, use room temperature egg whites. They whip up faster (at least for me). The cream of tartar in this recipe also helps stabilize them. The machine probably wasn’t fast enough. Think of it as if you were scrambling eggs: the purpose is to incorporate air into the eggs to make them fluffy, but your hands can only go so fast so they don’t actually whip. 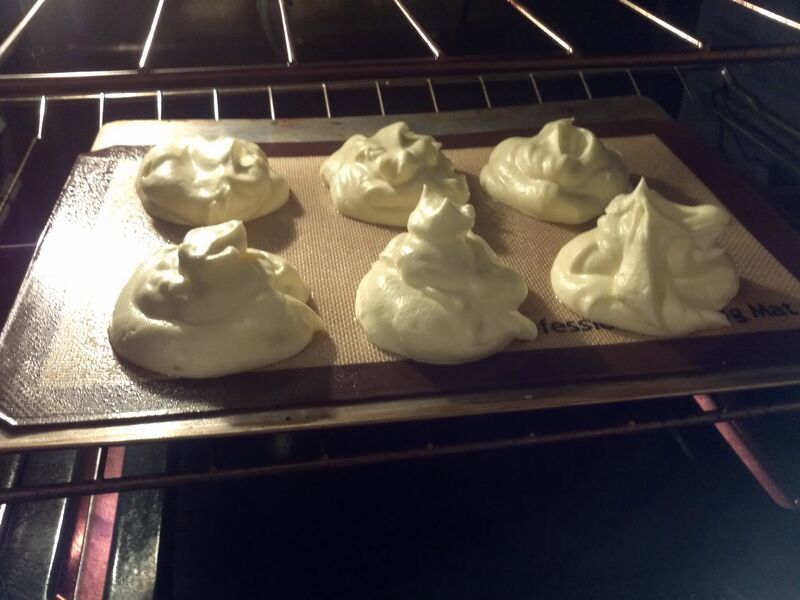 What you are doing is whipping the egg whites so that they hold structure. If they are still liquidy, they won’t hold any structure. The consistence of Cool Whip is what you want. These look like a meringue. Has anyone tried seasoning them? Also, could they be formed more before baking? Put them in a baggy in the fridge for awhile and then they are soft like a bun.